While collected volumes of comics are priced based on their contents…I’m finding more and more lately that paper quality and format lend a different sort of visual perception to the mix. Take The Heroic Age TPB. $24.99…yet, it’s about twice as thick as the $14.99 Deadpool: Secret Invasion volume. Twice the size, but $5 less than twice the price. Compare that to Deadpool Classic vol. 1: The Heroic Age…roughly the same thickness is $24.99…yet Deadpool Classic is $29.99–$5 more. Looking at Deadpool & Cable, there’s a similar thickness—a little more to it than the Classic volume, granted—but it’s $39.99…a $10 difference for not a lot of difference in size. Those have different contents, though, by several issues at least. Bringing a hardcover into the mix…look at the Invincible Iron Man by Fraction and Larrocca vol. 1 OVERSIZED hardcover. 19 issues in this volume for $39.99…and 18 issues in Deadpool & Cable…which is a paperback, but also carrying that $39.99 price. With all interests in characters/series (and consideration of quality) being equal…The Iron Man volume would seem to be a much better value for number of issues’ content and physical size/format for the price. Of course, I do know there are reasons (which may not come to me off the top of my head or that I—in terms of simply purchasing books—don’t even care about) for the varying prices. Print runs, quality of paper, creator royalties, projected profits, and who knows what all. While I lack a photo at present for the visual…another point of interest are the Vertigo $4.99 TPBs that collect the first issue of many of their popular series. (Additionally, Top Cow recently put out a $4.99 volume with the first issue of several of their soon-to-debut series). Of course, it’s a much different thing to have an “anthology” type volume with a single chapter from multiple series. These serve more as samplers, as opposed to a volume that collects an entire story. Though Top Cow has recently hooked me with their bargain-priced premiere volumes of Witchblade, Witchblade: Redemption, and The Darkness, collecting an entire arc (5-6 issues) of each for only $4.99. That’s 4-5 “extra” issues compared to the $3.99 single-issue pricepoint of far too many comics out there these days. On a much different note, but dealing with thick volumes and a little with pricing (getting more expensive through the years for successive reprints of the same content/volumes)…Knightfall, and Essentials. I have all three Knightfall volumes…but each is a different printing. Vol. 1 is the original printing from the mid-1990s. Vol. 2 is from the later printing…maybe early 2000s or late-1990s. And the third volume is from the last few years, whenever it was reprinted after DC changed to their present version of the DC “star” and trade-dress. 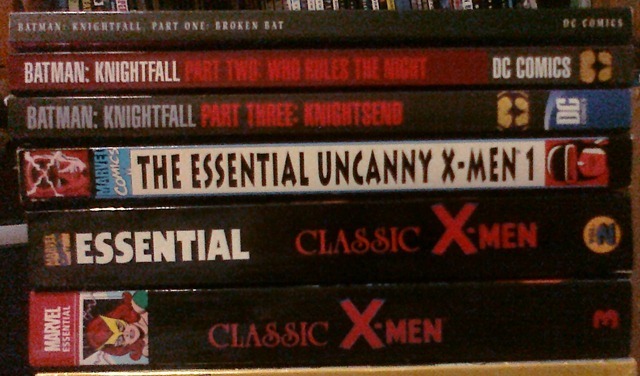 The Essential Uncanny X-Men vol. 1 I bought the week before I went off to college, back in August 1999. After the Essentials’ trade dress was revamped, they continued reprinting those earliest X-men issues as Essential Classic X-Men, but numbered the volume as 2, picking up from Essential Uncanny. And finally, under the newest revamp of the trade dress (AND pricing), they put out a 3rd volume. While the price that I paid was right—I got vols. 2 and 3 of both sets for at least half-off—I’m the sort of person who likes it when a series actually looks like it goes together…whether first editions, second prints, or 10th-print and beyond. 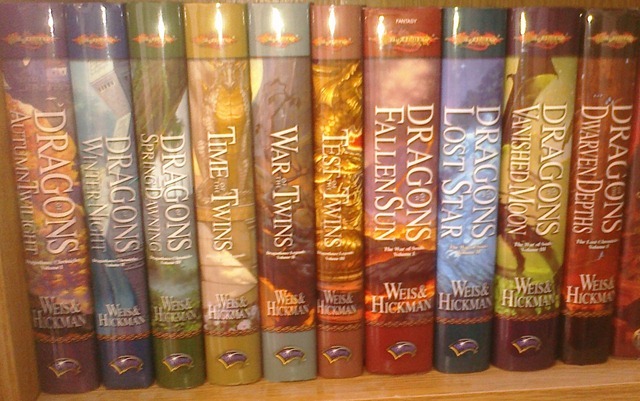 Actually looking like a single series, my Weis/Hickman Dragonlance volumes sit together on a shelf. Ultimately, this is an ongoing series of core characters by these authors. The books all go together, and in this particular edition, they look like it. Most of these books have seen numerous different editions in paperback with successive printings and even different publishers. Dragons of Autumn Twilight was originally published in the mid-1980s, while Dragons of the Dwarven Depths wasn’t published until about 20 years later. I don’t collect books—or comics, or collected volumes/TPBs/graphic novels/whatever for value. But I am very much a collector in wanting to read the stories (I prefer bookshelf editions to single issues these days, given choice and feasibility) and enjoying when the volumes that I get look good together, on the shelf. I’d seen this image in ads for a couple weeks or so, and assumed–knowing the coming X-Men #1 will have the mutants fighting vampires–that this ‘event’ would be taking place in X-Men #1, setting up that arc. Turns out this is its own separate one-shot, serving as a prologue to the upcoming run. 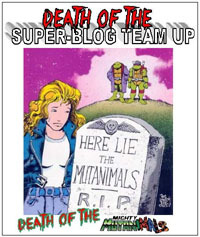 This is one of the few issues where having only seen a couple ads–nothing near enough to get “old” nor “annoying” or otherwise turn me off to the concept–and as a regular cover with the black and reds contrasting handily with the blue and yellow of the The Heroic Age banner across the top I was actually drawn in BY the cover. The issue felt thicker than an average issue, so though I was gritting my teeth and feeling a little dirty for going against my anti-$3.99 principles I bought the issue anyway. Rather than only 22-30/32 story pages, we have 40 pages of story, which alleviates SOME of the concern with the cover price…this is a special one-shot with more pages than a standard issue of a regular, ongoing series…so the higher than $2.99 price has some merit. The story is quite detailed, with a lot going on–a lot of setup, context, exposition…and general foundation-building for the new status quo of vampires in the Marvel Universe. We find the sons of Dracula, each part of different vampire factions/families/clans/sects/covens/whatever attending a regular meeting of all these groups–an event that takes place every century or so. One of the sons launches into a savage strike against their father–Dracula, intending to spur change from the status quo for all vampires. Rather than hide behind “the way it’s always been,” he seeks to initiate change to “how things can be, moving forward” (though without the vampires and murder part, sounds like something from a motivational speech for a corporate environment). With Dracula dead (hey, it’s not a spoiler if it’s the title of the one-shot, on the cover!) the vampires have to determine where they’re headed–do they reunite under a single leader, split into two groups to war against each other, or some other option? I read the few issues of Blade that came out back in ’98 or ’99 shortly after the first Wesley Snipes film, but that’s about the extent of my familiarity with Marvel’s vampires. The way they’re portrayed visually in this issue has a certain air of the familiar…nothing seems like it’s really out of place or should belong elsewhere. The idea of these multiple factions, the occasional reunion, etc. does not seem far-fetched (though it does have a sense of being borrowed from elsewhere). I chalk that up to something fairly standard in literature regarding vampires…a familiar aspect that generally ought to be present unless one is trying to radically reinterpret the very genre. So I not only have no problem with the art, I like the art…it fits the story very well, and conveys so much of what is necessary to getting things across to the reader in short order, in terms of the differing factions and lifestyles of all the different vampires. They come from all over the world, all walks of life and cultures; the common thread being–wait for it–they’re all vampires. The story itself is–for what it is–fantastic. Gischler found his way onto my radar with Deadpool: Merc With a Mouth, and though I have no interest in getting back into the X-Men beyond following Second Coming, seeing his name attached to a major X-Men book was encouraging. What Gischler does in this issue is introduce us to the vampires, lay foundation for who and what they are, where they’ve come from…and set up where they’re going, the new status quo that will allow for them to operate in the open, such that they even could reasonably interact with the X-Men and other general Marvel Universe characters not typically associated with the shadows of the universe. He also manages to avoid the route that I thought he was taking things. keeping to the familiar yet avoiding an exact predictability. And partially for that…I now, thanks to this one issue, have an actual interest in seeing where these characters go. Though this serves as a prologue, presumably, to the coming X-Men story…it works very well on its own as a single-issue/one-shot. You get a complete story from beginning to end…just that as with virtually any film, the ending is left open such that there “could” be a sequel or continuation from what was laid down here. I decided to pick this issue up, having enjoyed the last several Johnny DC books I’ve tried. Unfortunately, I found myself somewhat disappointed with what I got in this issue. The issue opens at the tail-end of an adventure shared by Batman and Aquaman, before Batman learns of a monster tearing apart London. Joined by Power Girl, he faces this composite creature, formed from civilians in a several-block radius of one of Luthor’s devices. The story resolves in a fitting manner for the style, and leaves things ready for the next issue. The art seems to be a mix of classic Batman from the silver age, the Super-Friends cartooney-style, and a hint of the Adam West Batman. Of course I assume it’s also inspired by the cartoon this series is based on, but not yet having seen an episode of that, I reference what I know. The style works, as it lacks the dark, grim, and gritty style that would likely be fairly inappropriate for kids and hams up the almost cheery, lighter style that could draw the younger crowd in while not traumatizing them if they move on to the mainstream DC version. The story is simplistic, but that’s me as an adult pushing 30. I’m sure it’s well within range of appropriateness for the target audience of this book. Simplistic though it may be, it is not unenjoyable–just slightly cheesey/hokey…but I expect that going in. My main complaint with the issue is the lack of Blue Beetle and so little of Aquaman. If you’re looking for a “fun” version of Batman, this seems a good one to go with–plus you’ll have other familiar characters along for the ride. I would be curious as to kids’ reaction to this issue, as it seems perfectly appropriate for the younger crowd–I just can’t speak to their actual enjoyment.